Author(s): Saurabh Pandey, Paul N. Shaw, Amitha K. Hewavitharana. School of Pharmacy, The University of Queensland, Brisbane, Australia. Tropical plants are important sources of anti-cancer lead molecules. According to the US National Cancer Institute, out of the 3000 plants identified as active against cancer using in vitro studies, 70% are of tropical origin. The extraction of bioactive compounds from the plant materials is a fundamental step whose efficiency is critical for the success of drug discovery efforts. There has been no review published of the extraction procedures of anti-cancer compounds from tropical plants and hence the following is a critical evaluation of such procedures undertaken prior to the use of these compounds in cancer cell line studies, during the last five years. It presents a comprehensive analysis of all approaches taken to extract anti-cancer compounds from various tropical plants. (Databases searched were PubMed, SciFinder, Web of Knowledge, Scopus, Embase and Google Scholar). 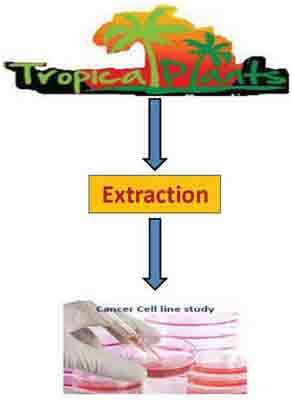 Keywords: Anti-cancer, bio actives, drug discovery, extraction, tropical plants. Affiliation:School of Pharmacy, The University of Queensland, Brisbane, Australia. Keywords:Anti-cancer, bio actives, drug discovery, extraction, tropical plants. Abstract:Tropical plants are important sources of anti-cancer lead molecules. According to the US National Cancer Institute, out of the 3000 plants identified as active against cancer using in vitro studies, 70% are of tropical origin. The extraction of bioactive compounds from the plant materials is a fundamental step whose efficiency is critical for the success of drug discovery efforts. There has been no review published of the extraction procedures of anti-cancer compounds from tropical plants and hence the following is a critical evaluation of such procedures undertaken prior to the use of these compounds in cancer cell line studies, during the last five years. It presents a comprehensive analysis of all approaches taken to extract anti-cancer compounds from various tropical plants. (Databases searched were PubMed, SciFinder, Web of Knowledge, Scopus, Embase and Google Scholar).